This morning I was asking Archangel Gabriel what is the ONE thing I can focus on today. Feeling a little overwhelmed by the To Do List and the Time available, I needed help on the time management side. The guidance I received was “Allow yourself to Receive”. 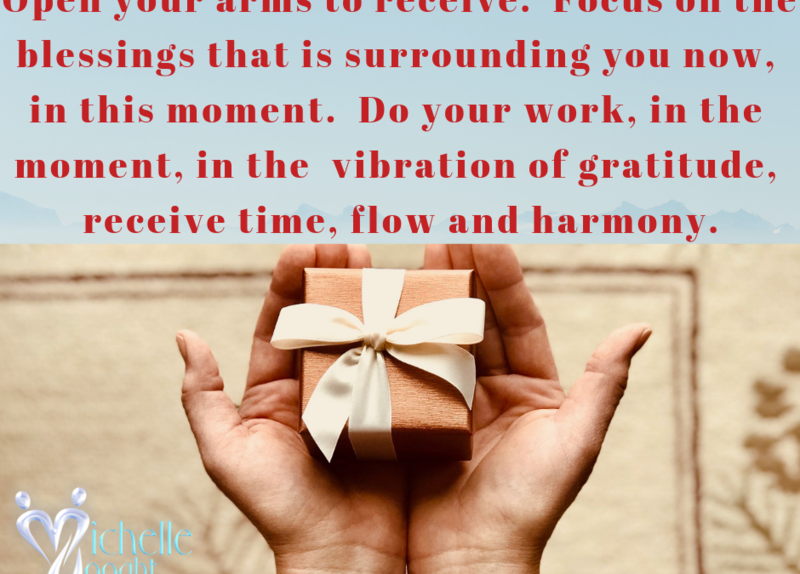 Receive time, receive flow, receive harmony, receive the present moment and all its blessings it is offering in this moment. I immediately moved into gratitude with a big smile on my face. :)…I am receiving the focus I need and whilst I am doing one thing at a time, I am experiencing flow, as opposed to resistance. I am experiecing inner harmony, as opposed to anxiety. It start with receiving and then BEING that which you are asking to come into your reality. Perhaps you are too much focussed on the time you don’t have? Or your attention is also on what hasn’t been done yet and what there still is to do? In this instance your vibration will be in alignment with what is NOT working, as opposed to what IS working. Just for today, open your arms to receive. Focus on the blessings that is surrounding you now, in this moment. Do your work, in the moment. Be in the moment of each day, with gratitude and in this vibration of gratitude, receive time, receive flow and receive harmony. Welcome the answered prayers that is being sent to you – align with what is present, what is on its way to you and open your arms wide, smile on your face, and a BIG thank you. Pay attention to what you DO want and lessen the focus on what you DONT want or have.